When you have to run inside on colder days, it helps to remember the perks of the ’mill. When temperatures drop, so does the stress load on your body. It’s a lot more challenging to hold your normal pace in the cold, and it often takes longer to recover, even from “easy” runs. Plus, it can be mentally draining to slog out slow, unpleasant kays day after day. Hitting the treadmill once or twice per week on the extremely cold or icy days of the winter allows for a higher quality workout with less stress on the body, and it can help you maintain fast-paced running fitness and form. Tip: Split it up: Run the first half outside and do the second half, when temps are higher, inside. You get the best of both worlds, and you can finish your run while streaming your favourite show. The treadmill is a convenient training partner, and it’s there for you any time you need it. I hit the treadmill when I’m running before sunrise or after sunset, when I’m alone and travelling, and when time isn’t on my side. I know I can get my run in on the treadmill and stay on course with my training until I can get outside again. And, I don’t have to worry about finding safe routes in areas I’m not familiar with or traveling with lights, maps, and other gear. Tip: Create a treadmill playlist to stay inspired and motivated. RELATED: Take the dread out of the mill with these on-demand Treadmill Workouts for Runners. On the treadmill, there is no risk of stepping into a pothole, making a wrong turn, or finding yourself on a course that is too challenging when you are supposed to be running easy. You can easily control your effort level, which is great for new runners or those getting back into it. The treadmill is also forgiving on the body in terms of impact, which can be beneficial for recovery after hard or long runs, or when coming back from an injury. Tip: After your walking cooldown, step on the side rails, turn the speed down to two to three kays per hour, and set a 4 to 5 percent incline. Then carefully side step, with your left side facing the front of the treadmill and your feet pointed in front of you. Repeat on each side for one minute and do two to three sets on each side. This is a great way to develop hip strength and to train in a different plane of movement. Flatlanders, rejoice! The treadmill is an effective way to prepare for a hilly race and to develop fitness and strength. You can create a DIY hill workout or follow one of the many hill programs most treadmills offer. On the flip side, those who hail from very hilly areas can take a break and run their workouts on level terrain, which is especially beneficial when training for a flat race. 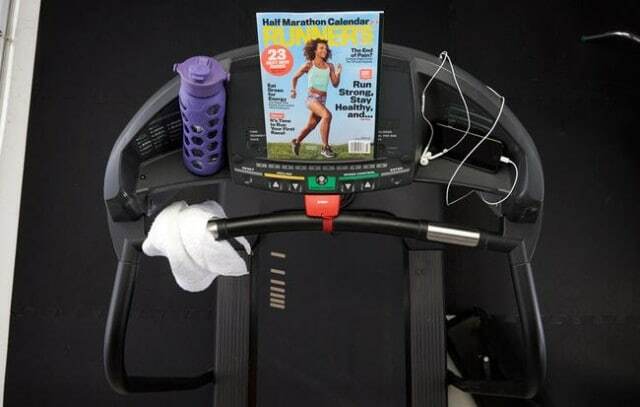 Tip: Make a copy of your race’s elevation map and post it on the treadmill. It’s a great way to visually prepare for the race and simulate the course profile.